I Buy Way Too Many Records Dot Com: Smalltown - Stuck 7"
Sorry about missing yesterday, it was one of those days where I just woke up and didn't feel like writing. I was going to write about another Odd Numbers 7", but now it's Tuesday, so I'll just save it for next Monday. 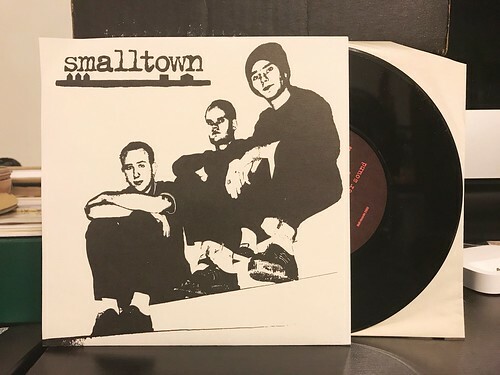 Today I have another 7" from the same batch of records I bought on Discogs, the first Smalltown 7"
This band crept onto my radar the way a lot of bands do, they released some records on Snuffy Smile. The big one of which was a singles compilation called The First Three Years. All of the songs from this 7" also appeared on that CD, but it took nearly fifteen years to finally track down the 7". Now truthfully I'm not going to pretend that I was scouring the globe nonstop every day looking for this record, but I always had my eye out for it, hopeful to score a copy. The songs are among my favorite that Smalltown released. I'll always be partial to that first CD of theirs that I picked up. They have a way of merging a bouncy mod sound like The Jam or even The Odd Numbers at times with a grittier punkier rock that made them fit in on the Snuffy Smile roster. It's the right mix of catchy and gruff and I'm pretty excited to add this one to the piles. From the same order I also grabbed another 7" that appeared on that comp CD, so I'll post that one soon as well. Dulac - Must Be You 7"
Clearance - Are You Aware 7"
The Odd Numbers - Thrift Shoppin' 7"
The Odd Numbers - Easy Life 7"
Crocodile God - Two Days 12"